I’m finding it hard to leave. I feel like I just got to Australia and gotten back into the groove of life at La Perouse, and I’m being ripped away, back to a life of work, responsibility, and (this time of year, at least) cold weather. It will be good to see my friends and family again, but I feel that it is only taking place as a trade for other friends and family. The last few days have been a buzz of activities, occasionally interrupted but the creeping sadness of good-byes. We explored the southern head of the entrance to Sydney Harbor, made a huge gumbo pot using some file powder I brought from home (there is no file powder in Australia, or decent BBQ sauce, for that matter), enjoyed a wonderful send-off feed at Auntie Lois’s, and tip-toed through tearful good-byes on our way to the airport today. 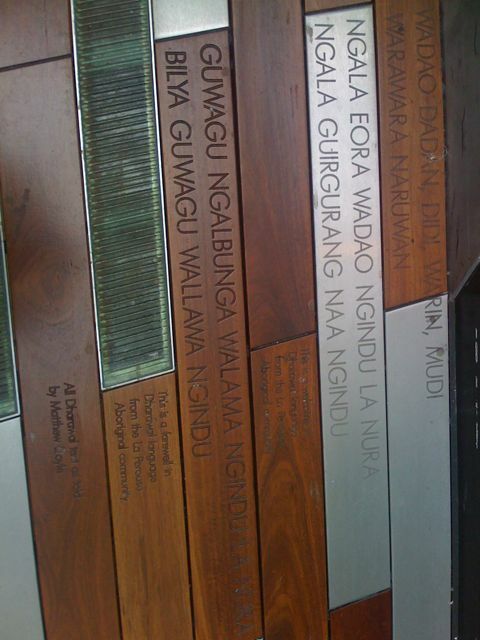 Just when I thought I could put the sadness behind me for a little while, I came across an art installation bridge in my airport terminal, featuring a traditional farewell in the Dhurawal language, done by some folks from the local Aboriginal community, where we’ve been spending most of our time. Now, I’m enjoying a $6 VB, looking out at a 747, and wondering about the meaning of it all. See you on the other side of the pond. I rejoice in your homecoming. But I, also, feel deeply your sadness in leaving a land and people you have come to know and care about. I believe we are all connected to each other; and, when such a bond is made as you and Katherine have done with the people at La Perouse, the Spirit becomes part of you. You did not leave it behind.